A dust explosion is the rapid combustion of fine particles suspended in the air within an enclosed location. Dust explosions can occur where any dispersed powdered combustible material is present in high-enough concentrations in the atmosphere or other oxidizing gaseous medium, such as pure oxygen. In cases when fuel plays the role of a combustible material, the explosion is known as a fuel-air explosion. Dust explosions are a frequent hazard in underground coal mines, grain elevators, and other industrial environments. They are also commonly used by special effects artists, filmmakers, and pyrotechnicians, given their spectacular appearance and ability to be safely contained under certain carefully controlled conditions. Thermobaric weapons utilize this principle by rapidly saturating area with an easily combustible material and then igniting it to produce explosive force. These weapons are the most powerful non-nuclear weapons in the world. If rapid combustion occurs in a confined space, enormous overpressures can build up, causing major structural damage and flying debris. The sudden release of energy from a "detonation" can produce a shockwave, either in open air or in a confined space. 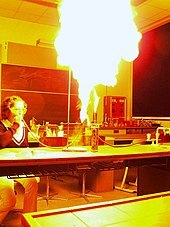 If the spread of flame is at subsonic speed, the phenomenon is sometimes called a "deflagration", although looser usage calls both phenomena "explosions". Dust explosions may be classified as being either "primary" or "secondary" in nature. 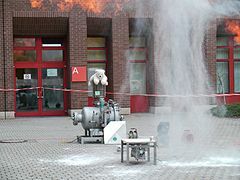 Primary dust explosions may occur inside process equipment or similar enclosures, and are generally controlled by pressure relief through purpose-built ducting to the external atmosphere. Secondary dust explosions are the result of dust accumulation inside a building being disturbed and ignited by the primary explosion, resulting in a much more dangerous uncontrolled explosion that can affect the entire structure. Historically, fatalities from dust explosions have largely been the result of secondary dust explosions. Mount Mulligan mine disaster in Australia 1921. These cable drums were blown 50 feet (15 m) from their foundations following a coal dust explosion. Many common materials which are known to burn can generate a dust explosion, such as coal and sawdust. In addition, many otherwise mundane organic materials can also be dispersed into a dangerous dust cloud, such as grain, flour, starch, sugar, powdered milk, cocoa, coffee, and pollen. 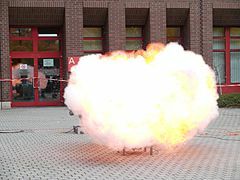 Powdered metals (such as aluminum, magnesium, and titanium) can form explosive suspensions in air, if finely divided. Explosive dust can arise from activities such as transporting grain, and grain silos have often been demolished violently. Mining of coal leads to coal dust, and flour mills likewise have large amounts of flour dust as a result of milling. A gigantic explosion of flour dust destroyed a mill in Minnesota on May 2, 1878, killing 14 workers at the Washburn A Mill and another four in adjacent buildings. A similar problem occurs in sawmills and other places dedicated to woodworking. 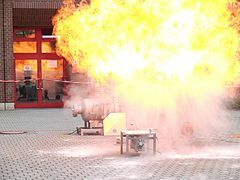 Since the advent of industrial production–scale metal powder–based additive manufacturing (AM) in the 2010s, there is growing need for more information and experience with preventing dust explosions and fires from the traces of excess metal powder sometimes left over after laser sintering or other fusion methods. For example, in machining operations downstream of the AM build, excess powder liberated from porosities in the support structures can be exposed to sparks from the cutting interface. 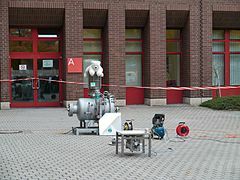 Efforts are underway not only to build this knowledgebase within the industry but also to share it with local fire departments, who do periodic fire-safety inspections of businesses in their districts and who can expect to answer alarms at shops or plants where AM is now part of the production mix. Although not strictly a dust, paper particles emitted during processing - especially rolling, unrolling, calendaring/slitting, and sheet-cutting - are also known to pose an explosion hazard. Enclosed paper mill areas subject to such dangers commonly maintain very high air humidities to reduce the chance of airborne paper dust explosions. 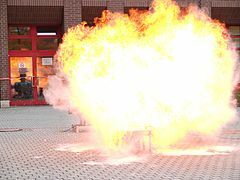 In special effects pyrotechnics, lycopodium powder and non-dairy creamer are two common means of producing safe, controlled fire effects. To support rapid combustion, the dust must consist of very small particles with a high surface area to volume ratio, thereby making the collective or combined surface area of all the particles very large in comparison to a dust of larger particles. Dust is defined as powders with particles less than about 500 micrometres in diameter, but finer dust will present a much greater hazard than coarse particles by virtue of the larger total surface area of all the particles. 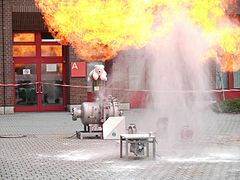 Below a certain value, the lower explosive limit (LEL), there is insufficient dust to support the combustion at the rate required for an explosion. A combustible concentration at or below 25% of the LEL is considered safe. Similarly, if the fuel to air ratio increases above the upper explosive limit (UEL), there is insufficient oxidant to permit combustion to continue at the necessary rate. Determining the minimum explosive concentration or maximum explosive concentration of dusts in air is difficult, and consulting different sources can lead to quite different results. Typical explosive ranges in air are from few dozens grams/m3 for the minimum limit, to few kg/m3 for the maximum limit. For example, the LEL for sawdust has been determined to be between 40 and 50 grams/m3. It depends on many factors including the type of material used. 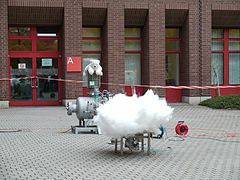 Typically, normal atmospheric oxygen can be sufficient to support a dust explosion if the other necessary conditions are also present. High-oxygen or pure oxygen environments are considered to be especially hazardous, as are strong oxidizing gases such as chlorine and fluorine. Also, particulate suspensions of compounds with a high oxidative potential, such as peroxides, chlorates, nitrates, perchlorates, and dichromates, can increase risk of an explosion if combustible materials are also present. However, it is often difficult to determine the exact source of ignition when investigating after an explosion. When a source cannot be found, ignition will often be attributed to static electricity. Static charges can be generated by external sources, or can be internally generated by friction at the surfaces of particles themselves as they collide or move past one another. Dusts have a very large surface area compared to their mass. Since burning can only occur at the surface of a solid or liquid, where it can react with oxygen, this causes dusts to be much more flammable than bulk materials. For example, a 1 kilogram (2.2 lb) sphere of a combustible material with a density of 1 g/cm3 would be about 12.4 centimetres (4.9 in) in diameter, and have a surface area of 0.048 square metres (0.52 sq ft). However, if it were broken up into spherical dust particles 50 µm in diameter (about the size of flour particles) it would have a surface area of 120 square metres (1,300 sq ft). This greatly-increased surface area allows the material to burn much faster, and the extremely small mass of each particle allows them to catch on fire with much less energy than the bulk material, as there is no heat loss to conduction within the material. When this mixture of fuel and air is ignited, especially in a confined space such as a warehouse or silo, a significant increase in pressure is created, often more than sufficient to demolish the structure. Even materials that are traditionally thought of as nonflammable (such as aluminum), or slow burning (such as wood), can produce a powerful explosion when finely divided, and can be ignited by even a small spark. A dust explosion can cause major damage to structures, equipment, and personnel from violent overpressure or shockwave effects. Flying objects and debris can cause further damage. Intense radiant heat from a fireball can ignite the surroundings, or cause severe skin burns in unprotected persons. In a tightly enclosed space, the sudden depletion of oxygen can cause asphyxiation. Much research has been carried out in Europe and elsewhere to understand how to control these dangers, but dust explosions still occur. The alternatives for making processes and plants safer depend on the industry. In the coal mining industry, a methane explosion can initiate a coal dust explosion, which can then engulf an entire mine pit. As a precaution, incombustible stone dust may be spread along mine roadways, or stored in trays hanging from the roof, to dilute the coal dust stirred up by a shockwave to the point where it cannot burn. Mines may also be sprayed with water to inhibit ignition. Some industries exclude oxygen from dust-raising processes, a precaution known as "inerting". Typically this uses nitrogen, carbon dioxide, or argon, which are incombustible gases which can displace oxygen. The same method is also used in large storage tanks where flammable vapors can accumulate. However, use of oxygen-free gases brings a risk of asphyxiation of the workers. Workers who need illumination in enclosed spaces where a dust explosion is a high risk often use lamps designed for underwater divers, as they have no risk of producing an open spark due to their sealed waterproof design. Good housekeeping practices, such as eliminating build-up of combustible dust deposits that could be disturbed and lead to a secondary explosion, also help mitigate the problem. Dust clouds are a common source of explosions, causing an estimated 2,000 explosions annually in Europe. The table lists notable incidents worldwide. Washburn "A" Mill explosion May 2, 1878 Minneapolis, Minnesota United States grain dust 22 Destroyed the largest grain mill in the world and leveled five other mills, effectively reducing the milling capacity of Minneapolis by one-third to one-half. Prompted mills throughout the country to install better ventilation systems to prevent dust build-up. Douglas Starch Works explosion May 22, 1919 Cedar Rapids, Iowa United States corn starch 43 30 The blast was felt for miles around and completely leveled the plant owned by the company. Mount Mulligan mine disaster September 19, 1921 Mount Mulligan, Queensland Australia coal dust 75 The series of coal dust explosions within a mine rocked the close-knit township and was audible as far as 30 kilometres (19 mi) away. Benxihu Colliery explosion April 26, 1942 Benxi, Liaoning Manchukuo (now China) coal dust and gas 1,549 34% of the miners working that day were killed. This is the world's worst-ever coal-mining accident. Blaye grain explosion August 1997 Blaye France grain dust 11 1 Explosion in a grain storage facility at the Société d’Exploitation Maritime Blayaise killed 11 people in nearby offices and injured one. Formosa Fun Coast explosion June 27, 2015 New Taipei Taiwan colored starch powder 15 498 Explosion when Holi-like colored powder was released at an outdoor music and color festival at the Formosa Fun Coast. ^ Harding, Luke (2007-09-11). "Russia unveils the 'father of all bombs'". The Guardian. ISSN 0261-3077. Retrieved 2019-01-19. ^ "OSHA Fact Sheet: Hazard Alert: Combustible Dust Explosions" (PDF). osha.gov. Retrieved 2018-01-23. ^ a b c Simpson, Timothy W. (2017-08-17), "Will My AM Part Explode? Not if you're careful. Parts built from metallic powder require extra precautions", Modern Machine Shop. ^ "Detonation Films - Why Coffee Creamer?". Retrieved March 20, 2011. ^ a b c d Hought, Julian (28 February 2011). "Dust to Dust". Retrieved 2015-07-02. ^ a b "Explosion suits settled". The Day. New London, Connecticut. 24 April 1980. p. 26. ^ "47 Die, 179 Injured in Blast at Linen Mill in Northeast China". Los Angeles Times. March 17, 1987. Retrieved 2015-07-02. ^ "Bosley explosion: Four missing in Wood Flour Mills blast". July 17, 2015. Retrieved 2015-12-02. ^ "Bosley Wood flour mill explosion: Fourth body found in wreckage of building gutted by blast". July 27, 2015. Retrieved 2015-12-02. Barton, John, ed. (2002). Dust Explosion Prevention and Protection: A Practical Guide. Institution of Chemical Engineers. ISBN 0-85295-410-7. Eckhoff, Rolf K. (1997). Dust Explosions in the Process Industries (2nd ed.). Butterworth-Heinemann. ISBN 0-7506-3270-4. Price, David J. (1921). "A Disastrous Explosion of Starch Dust". American Miller and Processor. National Miller Publications. 49 (1–6). Wikimedia Commons has media related to Dust explosion. http://www.hse.gov.uk/pubns/books/hsg103.htm - HSE (UK) advice on safe handling of combustible dust.